"And my aim in my life is to make pictures and drawings, as many and as well as I can; then, at the end of my life, I hope to pass away, looking back with love and tender regret, and thinking, 'Oh, the pictures I might have made!'" Within each of the alphabetic categories below you'll find information and graphics for all of Vincent van Gogh's 864 paintings (as well as an additional 1,340 graphics on the Drawings, Letter Sketches and Watercolours pages). 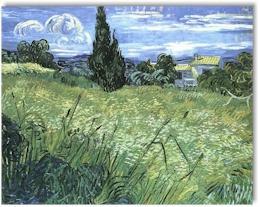 This represents 100% of Van Gogh's paintings that I've made available within this Gallery. Of course, there will be ongoing efforts to improve the quality of the graphics offered. With few exceptions (the works destroyed in World War II, for example) I'll strive to have the best quality colour graphics available. At the moment, more than 95% of the graphics are in colour, but I promise to do my best to ensure that those last 5% are available in colour as well. Although all of Van Gogh's works are interesting--even if in poor quality and in black and white--nothing compares to the colours that Vincent himself intended. A brief word about the naming of the paintings. There has been no real convention in the naming of Van Gogh's paintings (and the naming from one language to the next complicates things even further). One reference may call a painting by one name, while another will choose something quite different. Keep this in mind as you explore these listings. For example, if you're interested in Van Gogh's Zouave portraits, you would likely search near the very end of the listings. If you did, you would only find one: "Zouave (Half Length)". "Hey, wait a minute! 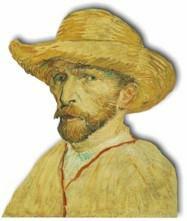 I know that Van Gogh produced six Zouave portraits." He did. The second is called "Seated Zouave" and can be found under the "S" listings, while the third is called "Portrait of Milliet, Second Lieutenant of the Zouaves" in the Portrait listings. The last three Zouave works comprise two drawings and a watercolour and can be found in the "Z" listings on the Drawings or Watercolours page. Note: For the visitor's convenience, I include a Search page in order to help find the right title as quickly and easily as possible. In addition, please excuse my "English-centric" approach to the alphabetizing. Paintings with "A", "An" or "The" in the title had the article moved to the end and were ordered accordingly. However, paintings beginning with "La", "Le" or "Les" have been listed under the "L"s.
Finally, I've tried to provide the best possible gallery of Vincent van Gogh's paintings on-line, but please note that the reliability of the graphics in terms of their likeness to the original must be approached with extreme caution. I've taken a moment to give a more detailed explanation as to the considerations of colour and quality.